Hi-Opt 1 is one more blackjack card counting system which will probably be more understandable for advanced players, not for newcomers of blackjack. It is almost similar to Hi-Lo count but some additional rules can be found there; moreover, card values of these two counting systems are completely different. Anyway, if you want to try using Hi-Opt 1 at blackjack table, you will not be able to do that if you are not familiar with Hi-Lo counting system: it is a basement for Hi-Opt1 (High Optimum) card counting strategy. Some players do not believe this system can really help to improve chances for winning more than other ones; but many professional blackjack gamblers insist that Hi-Opt 1 really works and helps to beat blackjack. 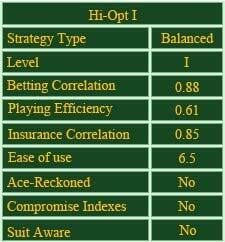 Hi-Opt 1 is sometimes called to be Einstein Count because it is the advanced card counting system. As well as any other system, Hi-Opt 1 is based on blackjack strategies and the principle of adding/subtracting points where your move will depend on the final result of your count. Remember: you should start with 0 and add or subtract a definite number of points every time when a card appears on the table. Do not forget to count not only your cards but also a dealer's and other players' ones! As you can see, the difference between Hi-Opt 1 and Hi-Lo counting systems are card values of 2's and Aces: they are neutral here and you should not count these cards. The very important point to remember: count cards in your head, do not even think about writing it down! Casinos do not like card counters, even if this method is not considered to be cheating. The final result of your counting with Hi-Opt 1 system should be 1. The closer to 1 you are - the more advantage you have at the moment; so, make your big wagers now. It would not be out of place to practice Hi-Opt 1 at home before using it at real blackjack table: this system is not as easy as it seems to be. If you are an expert of Hi-Opt 1 already, then you may have a desire to try Hi-Opt 2 counting system too.